Heat 2 tablespoons oil in a large saucepan over medium-high heat. Place venison in the saucepan and cook until evenly brown.Mix in the water, potatoes, carrots, green bell pepper, garlic, onion, salt and pepper. Bring to a boil. Reduce heat and simmer approximately 2 hours. Dissolve the bouillon into the venison mixture. Stir in the tomatoes. Cut top off the pumpkin and remove seeds and pulp. Place the pumpkin in a heavy baking pan. 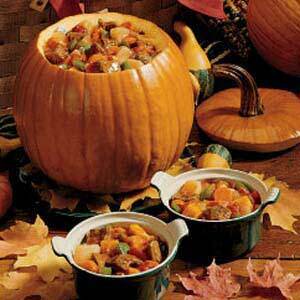 Fill the pumpkin with the venison mixture. Brush outside of the pumpkin with remaining oil.